Educators and students join us for this one of a kind worldwide event May 14-18 2018! 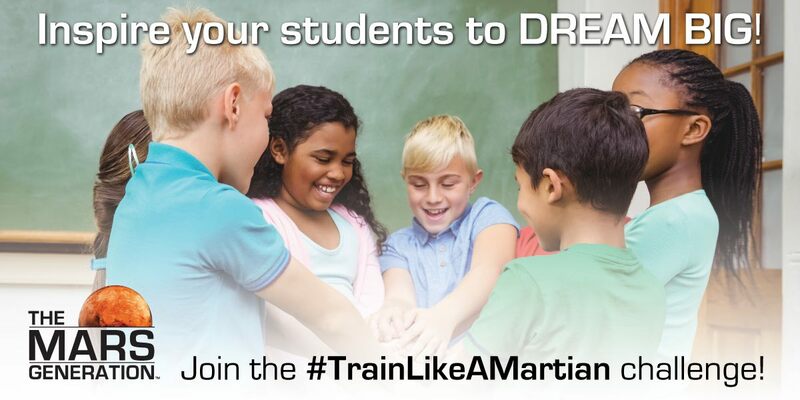 It’s our 3rd Annual #TrainLikeAMartian Challenge! The Mars Generation will be sponsoring an entire week of fun “astronaut training” activities to bring awareness to the importance of science, technology, engineering, arts, and math (STEAM) education, space exploration and physical fitness to children and adults around the world! The Train Like A Martian Challenge will be held May 14-18 2018. For a list of the daily activities and educator resource guides (including lesson plans, videos, modifications and more) click here. These challenges will be posted publicly each day of the challenge and emailed to all participants. This resource is so educators can plan ahead. Sign up here to receive updates about this event! Click here to get information about prizes and rewards schools can earn! 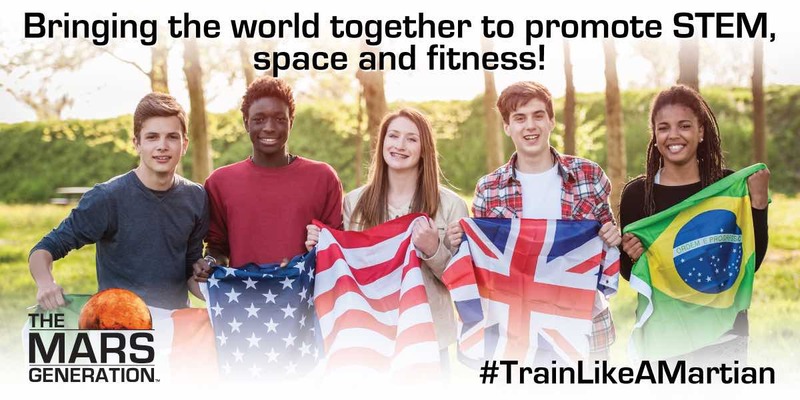 For our school partners, the Train Like a Martian Challenge is an opportunity to blend STEAM (science, technology, engineering, arts, mathematics) learning with exercise and highlight the importance of physical fitness in everyday life. Encouraging young people to think about how fitness and careers are linked is essential to our future workforce. While astronauts are required to maintain maximum fitness, we know that healthy, active people are more likely to be successful in the workforce regardless of the profession. The event is scheduled for the entire week of May 14-May 18, 2018. The Mars Generation will be following a curriculum of activities from the NASA Train Like An Astronaut Program* – this program is amazing and has all kinds of additional resources that educators can use including videos, progress sheets, instruction guides and more! You can check out our scheduled daily challenges with links to all of the NASA educators resources by clicking here. Having students do daily TMG challenge activities (you can modify activities to suit classroom space) and competition against other classrooms, students etc. Teachers competing against teachers for most challenge minutes accomplished with classrooms. Classrooms participating and teacher sharing photos online – students can follow other classrooms online for fun. Holding a school wide rocket run or other activity that marks the event. School wide TLM challenge participation every morning during homeroom or some other. All participants who follow the guidelines outlined here will be entered for prize drawings that will be held throughout each day of the challenge. Fundraising is not required for this challenge, but if your school chooses to fundraise your school will have a chance to win some cool additional prizes and earn some cool rewards too. Click here for information. Educators and Parents Prizes – All educators and parents who share their activities or support of the challenge on the #TrainLikeMartian hashtag on Twitter, Facebook and Instagram will be entered in a daily drawing during the challenge for chances to win TMG patches, TMG stickers, TMG keychains, TMG t-shirts and more. This drawing is a general drawing and includes entries from our entire online community. Click here to learn more about contest prizes and entry guidelines. All entries will also qualify for the grand prize drawings listed on the top of this page.